Most of McGinnis Lake Campground is grassy sites in a semi-open setting. The exception is the Trillium Loop whose sites are well spread out in a rolling woods, giving you both privacy and that feeling of camping up north. Located within this loop, directly across from site No. 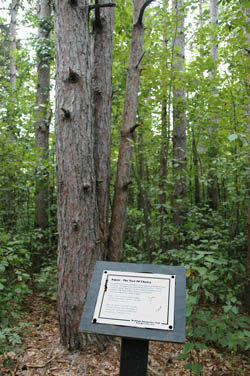 127, is the Whispering Pines Nature Trail, a 0.5-mile interpretive trail. This short trail is a pleasant leg-stretcher for anybody camping on the loop. It begins with a descent into a stand of red pine and then loops around a marshy kettle that can be beautiful in the fall before climbing back up to the campground. The entire walk is only 0.5 miles and scattered along it are six interpretive signs, no doubt only a fraction of what was originally erected here.